Paul Edis juggles many projects and, to mix a metaphor, keeps several plates spinning at once. Educator (principally here at Sage Gateshead), working musician, often as a bandleader, busy concert promoter, there can’t be enough hours in his day to take on much else, yet now he has another project bubbling along nicely…the Ushaw Ensemble. Working to a commission, Dr Edis wrote St Cuthbert’s Suite to be performed first at Ushaw College, then, next day, in the equally impressive surroundings of Durham Cathedral and has since found a receptive audience in the generally less salubrious surroundings of jazz clubs and festivals. 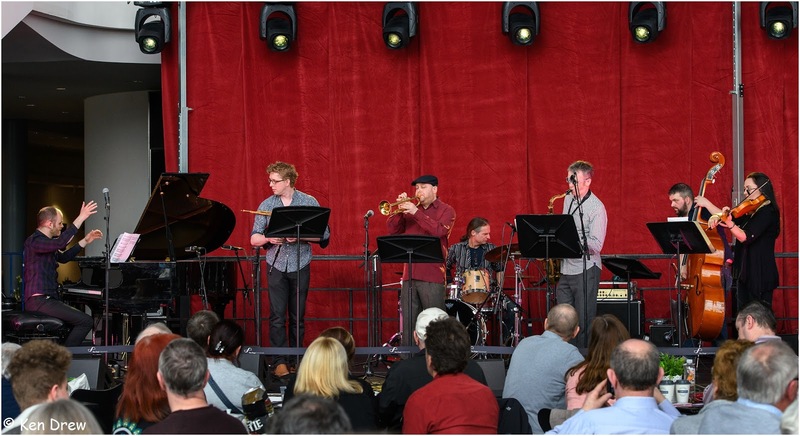 The Ushaw Ensemble opened Jazz North East’s Sunday afternoon schedule on the concourse. The usual line-up, including ‘folkie’ Andy May playing Northumbrian pipes, played two long form pieces in the forty or so minutes allotted to Edis’ seven-piece band. The Ensemble’s musicians, without exception, are accomplished soloists in their own right and Here and Now, Gone Forever placed several of them in the spotlight; Graeme Wilson’s assured tenor saxophone playing, Paul Edis reading reams of dots, the lyrical flugelhorn of Graham Hardy, bassist Paul Susans’ solo, a first contribution from the imperious Emma Fisk (violin), Andy May’s piping and Rob Walker, the man at the back, reading his part from behind the traps. So, all made their mark, with a Sunday brunch audience listening closely as the music finally became stilled. Achill Island lies off the west coast of Ireland and, on a visit to this remote part of the world, Edis found inspiration to compose The Sound of Achill, the second piece to be featured at this year’s Gateshead International Jazz Festival. Andy May stepped forward to play Northumbrian pipes – perhaps Cuthbert himself would have readily recognised the sound, more so than the sounds of ‘jazz’ instruments as we know them. St Cuthbert’s Suite is a piece of music deserving of further exposure with, perhaps, a recording session to document the project.